Are you thinking of having your dream wedding in Prague, Czech Republic? Why not to spice up your wedding day with some of our Czech traditions? We believe that adding some of our Czech traditions to your wedding day will bring you closer to your partner, your friends and family, not to mention they will surely add a little excitement to your day! 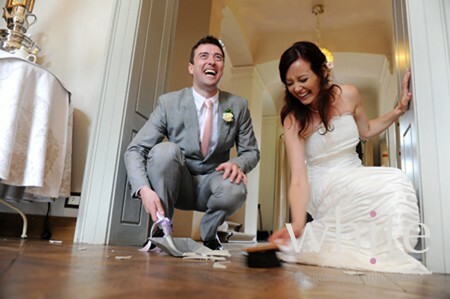 At the beginning of the Czech wedding reception, a plate is broken at the feet of the bride and groom and they must clean the pieces up together. It all means that pieces bring happiness and the newlyweds show a will to cooperate by jointly sweeping the pieces away and their marriage will therefore be harmonious. At the wedding reception, the bride and groom are covered in a large towel symbolizing unity, and then finish a bowl of soup using one spoon to symbolize the cooperation.